My name is Juan Jesús Roldán Gómez. I am a postdoctoral researcher at the Centre for Automation and Robotics (UPM-CSIC). 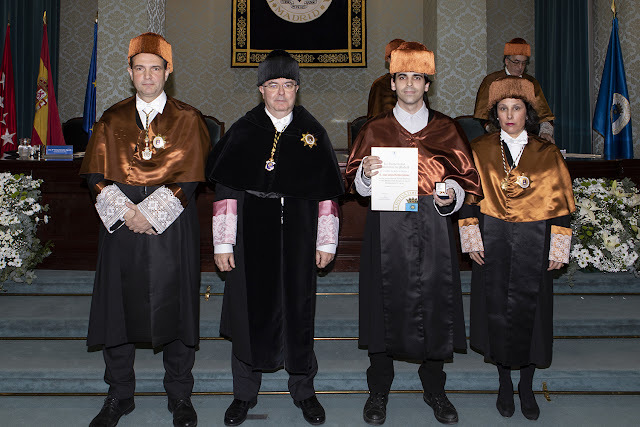 I got a PhD in Automation and Robotics from the Technical University of Madrid (2014-2018). Previously, I studied Bsc+MSc in Industrial Engineering with specialization in Automation and Electronics (2006-2012) and MSc in Automation and Robotics (2013-2014) at the same university. I have taken part in robotics projects with SENER and Airbus Defence and Space, as well as I have performed a research stay at the University of Luxembourg. During the last five years, I have researched about security systems for aerial robots, surveillance with teams of ground robots and application of robots to agriculture. 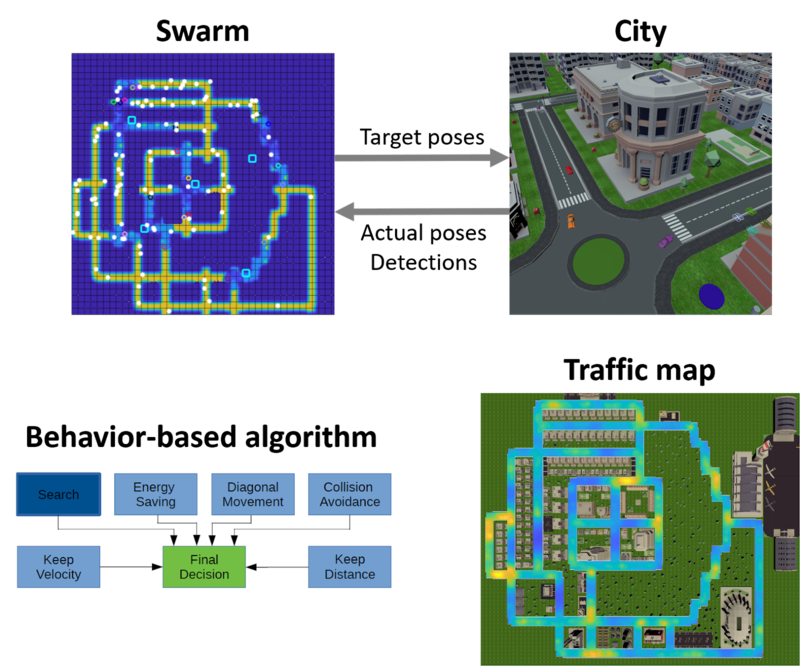 Currently, I am interested in multi-robot adaptive and immersive interfaces and robot swarms for monitoring cities, as well as in data mining and machine learning techniques. Mi nombre es Juan Jesús Roldán Gómez. Soy un investigador postdoctoral en el Centro de Automática y Robótica (UPM-CSIC). Hice el doctorado en Automática y Robótica en la Universidad Politécnica de Madrid (2014-2018). Anteriormente, estudié Ingeniería Industrial con especialidad en Automática y Electrónica (2006-2012) y Máster en Automática y Robótica (2013-2014) en la misma universidad. 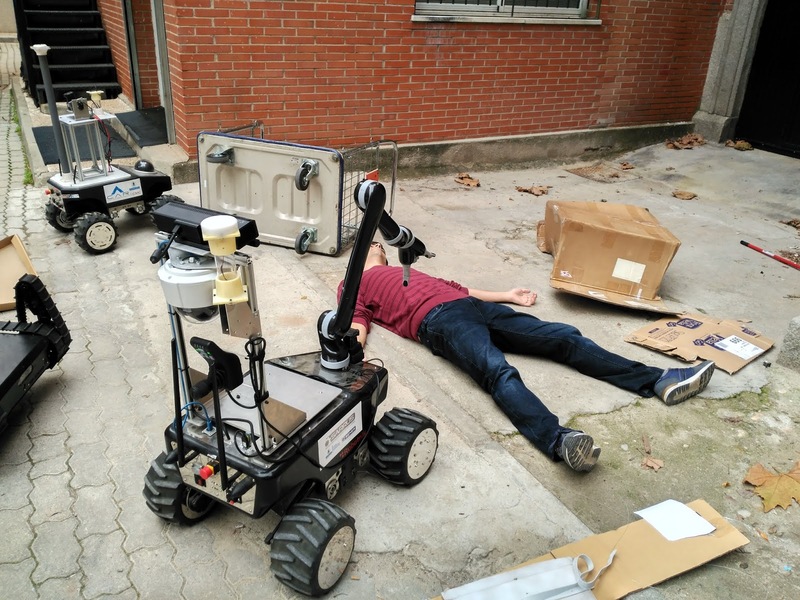 He participado en proyectos de robótica con SENER y Airbus Defence & Space y también he realizado una estancia de investigación en la Universidad de Luxemburgo. Durante los últimos cinco años, he investigado sobre sistemas de seguridad para robots aéreos, vigilancia con equipos de robots terrestres y aplicación de robots en agricultura. Actualmente, estoy interesado en las interfaces adaptativas e inmersivas para flotas de robots y el uso de enjambres de robots para monitorizar ciudades, así como en aprender más sobre técnicas de minería de datos y aprendizaje automático. I have taken part in the stand of the Robotics and Cybernetics Research Group (RobCib) in the Industriales Research Meeting (IRM2019), an event organized by the Industrial Engineering School of the Technical University of Madrid to disseminate the research. 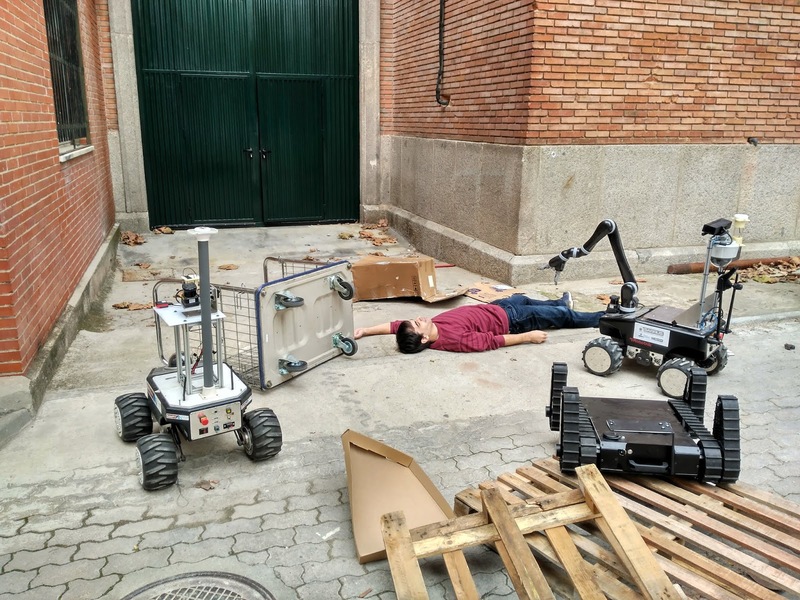 In this stand, we have shown the different robots of the group: a mobile manipulator, three search and rescue robots and a hyper-redundant robot. Additionally, we took some volunteers to test our virtual reality interface for monitoring the state of a smart city. I attended the workshop "how to tell my research in radio and TV", organized by the Scientific Culture Unit of the Technical University of Madrid. In this course, I learned how to deal with journalists, tell my research to the general public and take part in radio and TV programs. Moreover, we did a series of short TV interviews and a complete radio program. A great experience! After an amazing trip through Japan, I have participated in the PerCom 2019: IEEE International Conference on Pervasive Computing and Communications. This conference focused on Pervasive Computing and Communications is organized yearly by IEEE and this time has been celebrated in Kyoto. In particular, I have presented our work "SwarmCity Project: Can an Aerial Swarm Monitor Traffic in a Smart City?" 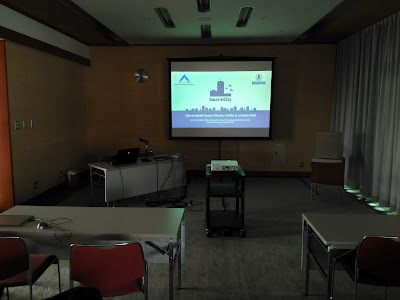 in the UNAGI'19 Workshop on UNmanned aerial vehicle Applications in the smart city: from Guidance technology to enhanced system Interaction. Our paper presents a behavior-based algorithm to allow an aerial swarm to perform surveillance tasks in a city, as well as a data fusion algorithm to build traffic maps from the cars detected by the drones. J.J. Roldán, P. Garcia-Aunon, E. Peña-Tapia and A. Barrientos. "SwarmCity Project: Can an Aerial Swarm Monitor Traffic in a Smart City?". UNAGI'19: Workshop on UNmanned aerial vehicle Applications in the smart city: from Guidance technology to enhanced system Interaction. PerCom 2019: 2019 IEEE International Conference on Pervasive Computing and Communications. Kyoto, 11-15th March 2019. Today I had the opportunity to teach a class at Agrocampus Ouest (Angers, France). 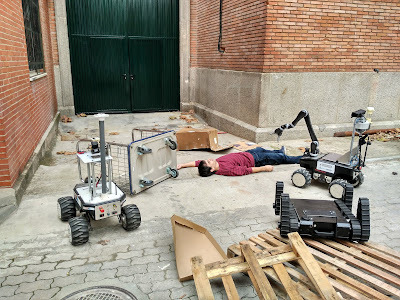 I have talked about my experience working with robots in agriculture in the Robotics and Cybernetics Research Group of the Technical University of Madrid. First, I have explained the RHEA european project, in which some colleagues were working when I arrived to the research group. Then, I have described our three works using robots to measure environmental variables in greenhouses: an aerial robot, a ground robot and a multi-robot system. Finally, I have presented the SUREVEG european project, in which we will work during the next year. I would like to thank Professor Gerhard Buck-Sorlin for giving me this opportunity, as well as the students for attending to my presentation and asking me a lot of interesting questions. I hope to repeat this experience soon!